The Third Commercial Resupply (CRS-3) mission was scheduled for launch on Monday, April 14, 2014. Taking off from the Cape Canaveral Air Force Station in Florida, the CRS-3 mission was to head to the International Space Station (ISS) at 4:58pm. However due to a helium leak on the launch vehicle, the launch has been postponed for Friday, April 18 at 3:25 p.m. If the repairs are made by Friday, the space pioneering company, Space X will be given the opportunity to test its Falcon 9 rocket and its unmanned Dragon cargo capsule in transporting materials and supplies to the ISS. The Falcon 9 rocket is not the only equipment requiring repairs. A critical computer onboard the ISS also failed to activate last Friday. Although NASA confirms that the ISS Crew was not any danger with the broken computer, a spacewalk to repair the system has been scheduled for April 22, 2014. The mission cancelled on Monday will transport materials astronauts can use to repair the computer system, as well as 5,000 pounds of additional supplies. Among these supplies are materials used by astronauts to execute more than 150 scientific investigations. Such investigations include laser optics tests to explore information exchange from space to Earth and National Institutes of Health funded immune system research projects. Also onboard the unmanned mission will be more than 48 different types of bacterial strands sponsored by Project MERCCURI, which stands for Microbial Ecology Research Combining Citizen and University Researchers on the International Space Station. Under the project, microbial samples were collected from stadiums, monuments, museums, retired space crafts, and other public sources throughout the United States. The purpose of sending the different types of microbes into space is to determine how the bacteria will grow in the absence of gravity. In addition to determining the effects of the absence of gravity on microbial growth, Astronauts on board the ISS will collect their own bacterial samples residing on fomites board the station. This study will help to establish the microbial flora of the ISS by identifying the different types of bacteria present. 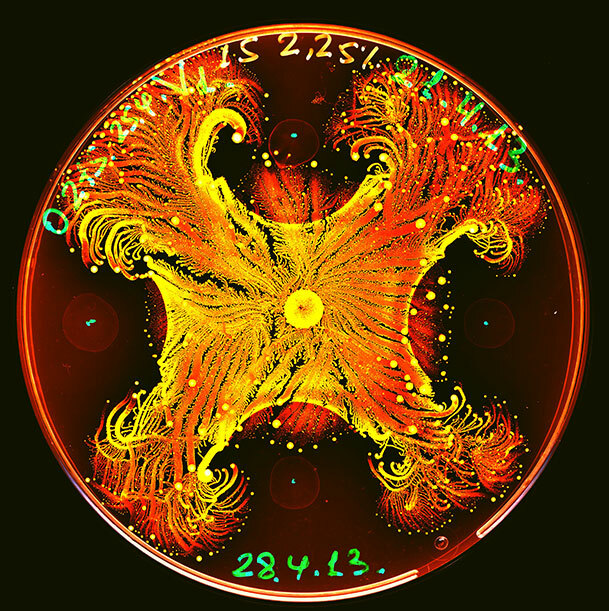 The study of microbes at zero gravity conditions is nothing new. The National Aeronautics and Space Administration (NASA) has conducted previous studies primarily investigating the virulent nature of pathogenic organisms in space. A study carried out in 2006 revealed Salmonellato express a higher degree of virulence when grown in a zero gravity environment. According to the study 167 genes and 73 proteins were found to have been altered in structure—the likely cause for the higher degree of virulency. Salmonella strains grown in space were brought back to Earth and their effects tested on mice. The studies showed that mice from the experimental groups were subject to illness at a faster rate than the control groups. NASA has also completed studies evaluating the effects of antigravity conditions on the human immune system. Their investigations show that the absence of gravity has an adverse effect on the human body and weakens the immune system. In essence, pathogens become stronger in the absence of gravity; while the human immune system becomes weaker. This finding may have grave implications for individuals hoping to travel to space or to be a part of the MarsOne human settlement scheduled for 2024. Contrary to NASA’s pathogenicity studies, Project MERCCURI’s research focuses on non-pathogenic bacteria and examination of their microbial growth properties. Findings of the study are likely to provide greater insight into the ubiquitous nature of bacteria and make actors in space exploration more cognizant about the bacterial environment around them. If repairs to the Falcon 9 rocket are successful and the launch continues as planned for Friday, the Dragon space craft is expected to dock at the station for four weeks. After four weeks it will return to Earth bringing with it supplies and experiments performed on the ISS. MERCCURI is a project made possible by the collaborative efforts of microBEnet/UC Davis with the Science Cheerleaders, Space Florida, Nanoracks, JPL-NASA, and SciStarter.com. 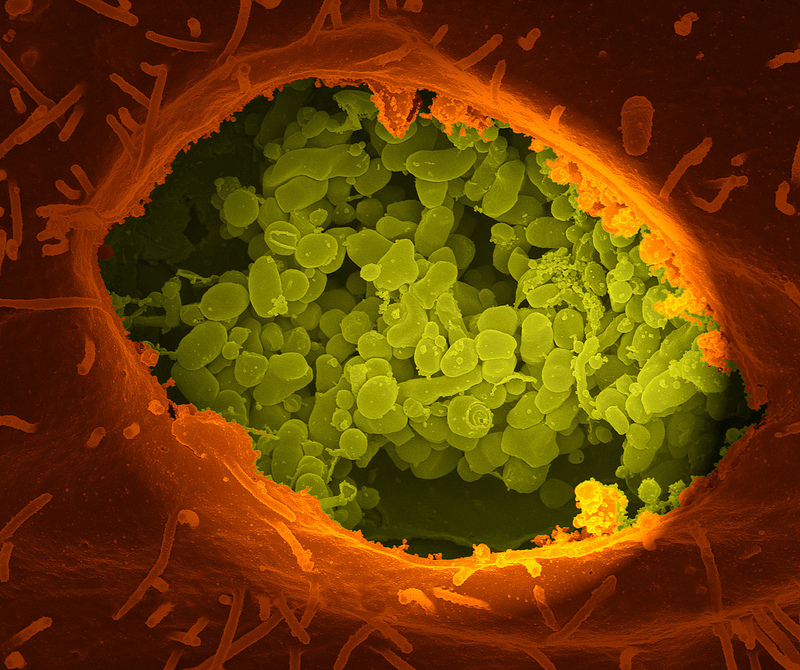 This week’s image depicts the vacuole of a Vero cell, within which Coxiella burnetii, the bacteria which causes Q fever, is growing. Infection with just one of those green bacterium can cause Q fever in humans, an often asymptomatic disease which can occasionally result in respiratory symptoms, enlarged liver and spleen, and rarely, death. Q fever is found throughout the world, and is transmitted to humans primarily through interaction with contaminated livestock. Because most research scientists (and their lab assistants) we know are so busy in the lab, they don’t have time for things like “lives” or “culture”. 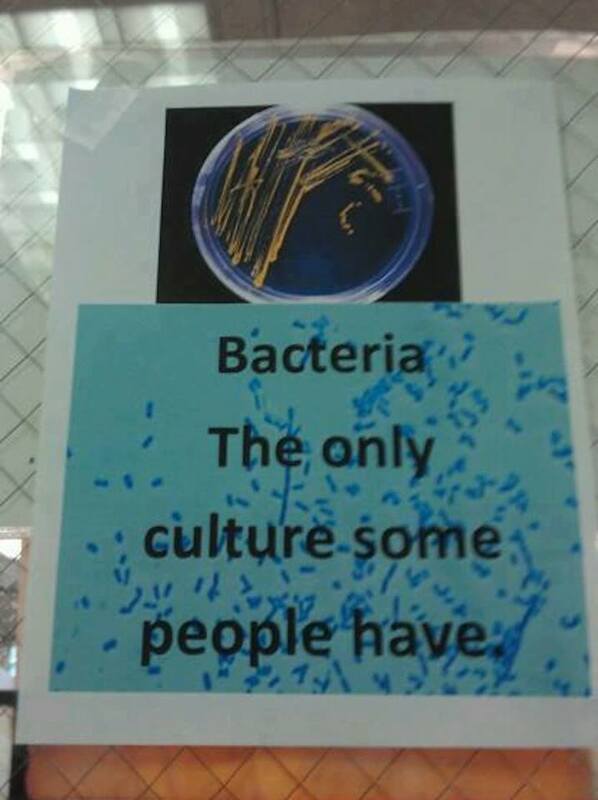 Luckily bacteria is pretty?